I have long lamented the lack of a good low carb vegan pancake recipe. Thankfully my fellow Dutchy and low carb genius Alynda solved the problem, by tweaking my waffle recipe into pancakes. It never quite worked out when I tried to do that, so I'm really quite indebted to her. She shared this wonderful invention in the Vegan Keto group on Facebook, so we could all experiment with it. I made a few more tweaks to adjust the recipe to my preferences and what I had on hand. The protein powder I use absorbs water very fast, so my pancakes came out quite a lot thicker than Alynda's, which were more crêpe-like. She will probably post her version of the recipe pretty soon. I really like the flavor and texture of these pancakes. They are crisp on the outside and fluffy on the inside, with a nice slightly 'eggy' taste, even though they are of course entirely egg-free. The inside can get slightly soggy, which I want to try and improve, but I like them so much already that I wanted to share the recipe as is (with kind permission from Alynda of course). Combine all the dry ingredients in a bowl and mix well. Add the milk and oil and stir until a thick batter forms. Different varieties of protein powder absorb different quantities of liquid, so start with 1/2 a cup of milk and add up to 1/4 cup more until you get a thick gloppy consistency. If your batter is a little more liquid, that's fine too, your pancakes will turn out more like crêpes. Pea protein for instance may give you a more liquid batter than the soy protein I used. Preheat a skillet to medium low heat and add a generous amount of oil to the pan. If the heat is too high or if you skimp on the oil, the pancakes will stick like crazy. Add little pancake sized globs of batter to the pan and flatten them a bit with the back of your spoon if needed. Now be patient. Your pancakes will stick to the pan at first, but they will release once they are properly cooked. This will take a few minutes. If you try to turn them over too early, you'll have a very hard time getting them out. Again, don't turn up the heat to high, or they'll stick even worse. Once the bottoms of your pancakes are golden brown and the sides have started to set, you can flip them. Let the other side cook for a few more minutes and then take them out of the pan. If you have more batter, add some new oil to the skillet and repeat. Serve your pancakes with sugar free syrup or preserves, fresh fruit, peanut butter, or whatever you like. I just wanted to say thanks for providing this info. Have you thought of putting together a resources page? I'm not interested in doing a full blown keto diet, but I am hypoglycemic and can't eat a standard WFPB diet because of this. I need to eat a much more isocaloric diet. At times it gets very trying when most of the online vegan/WFPB resources are "carbs good, fat bad, fat you eat fat you wear, carbs cure diabetes, eat moar carbs" rather than wanting to have a discussion. Pretty similar to talking to paleo folks about whole grains. It's nice to have a few places online to read less fat-phobic information. Thank you Feast! The low fat high carb gang drives me crazy sometimes too. As resources for lower carb vegan food are becoming more numerous, it may actually be a good time to put together a resources page. Thanks for suggesting it. Until then, if you look around the website, there are quite a few links to other blogs etc. who deal with this subject. thanks for this recipe. I've experimented a lot with LC vegan pancake recipes and this is the only one that comes out like 'cake'. I use ground chia instead of flax for the flavor. You can get big fluffy cakes depending on the amount of liquid you use. I'm so happy to be done experimenting! Glad you like it so much Chris! Does more liquid make them more fluffy? What does it taste difference with chia up versus flax? Hi Meg, too much liquid can make these pancakes a bit soggy. If you want them fluffier, you could also add a pinch more baking powder. Chia seeds have a slightly milder flavor than flax. Hi Tine, glad you like it! The recipe is one generous serving, so it is absolutely fine to eat them all. Made these this week and they were great! I have been low carb for almost 6 years and I had missed pancakes so much! I had them with sugar-free sauce. The recipe lists oil for the batter but I cannot see in the instructions where it is added? Thank you Becca, glad you liked the pancakes. I corrected the instructions to include the oil. You add it with the milk. This sounds like a great recipe! Thank you for sharing all your info with us. Have you made these GF? The one things we miss is pancakes and waffles as my husband is GF, and we are new to vegan and now low carb. Maybe you might even have a suggestion of a substitute? Hi Wendy, the vital wheat gluten is really the binder in this recipe, so it would be difficult to make it gluten free. 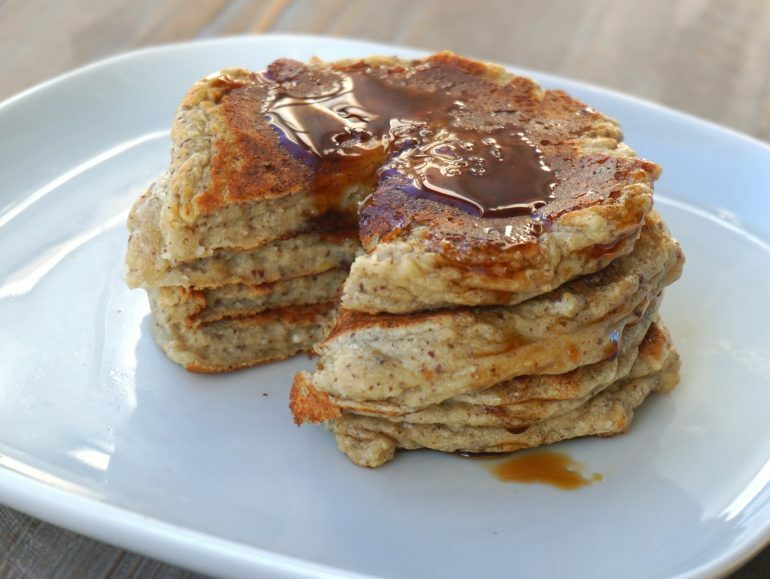 You could try experimenting with a combo of coconut and almond flour, protein powder and flax or chia to make GF pancakes.